This month’s Daring Cooks’ challenge is to braise something. I’m not sure if I’ve ever braised anything before – maybe by accident. Instead of taking my chance with something meaty, I chose one of my favourite, under-appreciated veggies – fennel. At first, I thought I might try braising a piece of lamb, but I didn’t get my act together. My eyes kept being drawn back to the fennel recipe. Poor little fennel, so often overlooked by people that don’t know what to do with it, or don’t like the taste of licorice. 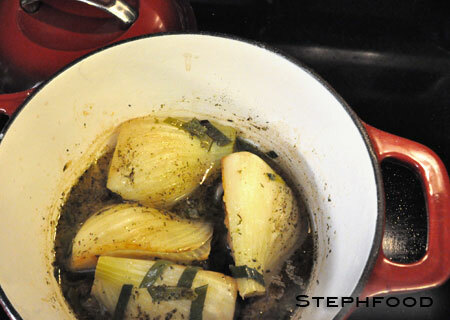 I’ve always loved fennel, but usually use it in the same ways… making it the perfect thing for me to braise. Braised Fennel - incredible sauce! It’s pretty rare for me to use fennel in a way that really makes it the star of the meal. It’s most often an ingredient in the mix, getting a little lost. Braising, however, made it soft, mild and quite buttery (with the addition of just a wee bit of butter). I was really surprised at the lovely sauce that developed out of the juices and herbs. It made me wish that I had made up some rice or mashed potatoes to pour the sauce over. This was unexpectedly incredible. I wasn’t sure how it would turn out, but it was great! 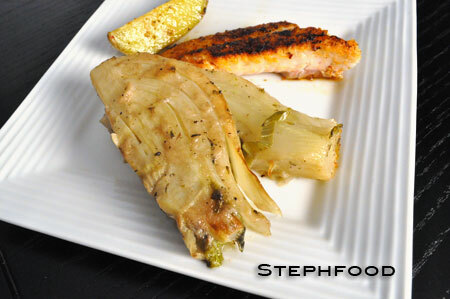 It’s a great side dish for fish and meat, and will convert anyone who doesn’t think they like fennel! Based on Ruhlman’s 20 cookbook, posted in the Daring Kitchen challenge for February 2012. Dredge the cut sides of the fennel in flour. Heat oil a cast iron dutch oven (with lid) over medium-high heat. Brown the floured sides of the fennel. Pour in broth until it covers 1/2 inch of the fennel. Add herbs, butter and salt and bring to a simmer. Cover, and place in oven. Cook for 20-30 minutes, until fennel is tender. Take advantage of the sauce by serving it on top of rice or pasta! 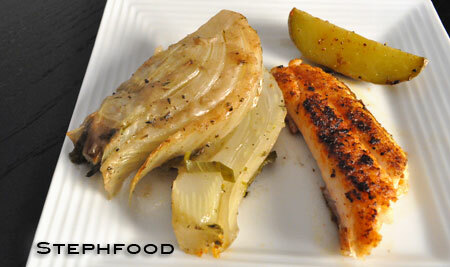 I don’t use a lot of fennel, specifically because I don’t like the taste of licorice, but it looks amazing braised! I might have to give it another shot! Fennel lover here! I almost did this but you’ll see on my post that I did a lot this month already. You made me laugh with the “poor little fennel” comment. I’ve personally never had it before, but after looking at your pictures, I might try it out. I love fennel, however what comes in at our market is rarely worth picking up, though I’m looking forward to trying this recipe when it’s possible. Good job with the under used veg. You are seriously making me want to give this recipe a try. I have never tried fennel, just because of it’s licorice rep… but man… this is very tempting. The fennel looks wonderful! I definitely have to try it! I’m very curious about the braised fennel, yours looks awesome, I’ll have to give it a try some time soon! Definitely on my ‘to try’ list when we next get fennel in the veg box. Delicious – a really beautiful job! Mm, I’m completely sold on the braised fennel now. It sounds wonderful! Great post – and so glad you enjoyed the fennel. I, too, was pleasantly surprised by how well this recipe turned out!